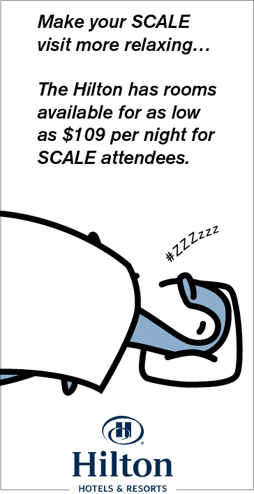 Registration for LPI exams at SCALE 10X is available by emailing LPI at events_at_lpi.org. Please indicate preferred exam(s) and time slot(s) when registering for exam events. Exams will be available at 11 am and 1 pm on Sunday January 22, 2012 in the Santa Monica "B" room, Los Angeles Hilton Airport Hotel. Each exam takes approximately 90 minutes to complete. Exams may be paid for in advance by PayPal or credit card with LPI. In addition, candidates should bring their LPI ID and a government issued photo identification to the exam lab. All three levels of LPI certification (LPIC-1, LPIC-2 and LPIC-3) will be offered at these events. The promotional price for all exams will be $99 US (regularly $173), except for LPI-301 (the LPIC-3 certification exam) which will be priced at $219 US (regularly $260). This is the 10th consecutive year of the Southern California Linux Expo and LPI's third year as a certification sponsor of the event. The Linux Professional Institute is globally supported by the IT industry, enterprise customers, community professionals, government entities and the educational community. LPI's certification program is supported by an affiliate network spanning five continents and is distributed worldwide in multiple languages at more than 7,000 testing locations. sponsorships, innovative programs and community development activities. LPI's major financial sponsors are Platinum Sponsors IBM, Linux Journal, Linux Magazine, Novell, SGI, and TurboLinux as well as Gold Sponsors, HP and IDG.